MOORESVILLE, N.C. (July 17, 2012) – Penske Racing announced today that third-generation race car driver Ryan Blaney has joined the organization and he will compete in the No. 22 Dodge in selected NASCAR Nationwide Series events over the balance of the 2012 season. Blaney, the 18-year-old son of current Sprint Cup Series driver Dave Blaney, will make his Penske Racing debut in the No. 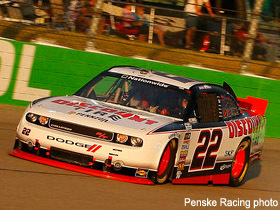 22 Discount Tire Dodge Challenger in the Nationwide Series race at Iowa Speedway on Saturday, August 4th. Blaney will also drive for the team in at least two other races this season. He will race the No. 22 Snap-on Dodge at Richmond International Raceway and he’ll drive the No. 22 Discount Tire Dodge at Kentucky Speedway. "Ryan is a driver with a great racing pedigree and we believe he has a very bright future in NASCAR," said Tim Cindric, President of Penske Racing. "We’ve been keeping an eye on Ryan’s development and we feel he’ll be a great addition to the No. 22 Nationwide Series team." With a winning junior developmental track record established in Quarter Midgets, Bandolero and Legends cars, Blaney has also raced successfully in Super Late Models and the ARCA Series as well as the NASCAR K&N Pro Series. Continuing his development in 2012, Blaney has made three Nationwide Series starts this season for Tommy Baldwin Racing and he was impressive in a seventh-place finish at Richmond earlier this year. "I’m very excited about the opportunity to drive for Penske Racing for the rest of this season," said Blaney. "With the team’s strong tradition of success and the winning program they’ve established in the Nationwide Series, I believe I can learn a lot and hopefully we can produce some strong finishes in the No. 22 car." Penske Racing is one of the most successful teams in the history of professional sports. Competing in a variety of disciplines, cars owned and prepared by Penske Racing have produced 359 major race wins, 419 pole positions and 23 National Championships. For more information about Penske Racing, please visit www.penskeracing.com.